Henry Burris, who quarterbacked the Owls in the mid ‘90s, recently won Canada’s Grey Cup. After 11 years with five teams in three leagues, former Temple quarterback Henry Burris won his first championship in his professional football career. Burris led the Calgary Stampeders, a Canadian Football League team, to the Grey Cup Finals, where the team won the Canadian equivalent of the Super Bowl. He was also named Most Valuable Player of the game. Burris’ three-country, two-continent journey began in Spiro, Okla., a town with a population of a little more than 2,000 people. “I remember recruiting him at his home in Oklahoma. He was a very shy and bashful young man,” said Ron Dickerson, the coach at Temple from 1993-1997 and current defensive backs coach at Lambuth University. Other schools like Oklahoma State and Texas Tech also recruited Burris, but he welcomed the idea of playing college football in Philadelphia. At Temple, while the team struggled – only winning eight games during Dickerson’s term – Burris had many positive experiences from his time as an Owl. “Temple built a great person in me. I’m glad I came here, and my life changed a lot when I came to Temple,” he said. Some highlights, he said, include meeting his wife, Nicole, a Temple lacrosse player. He also had some of the best individual seasons by a quarterback in school history, leaving the university ranked second all-time in Big East Conference passing yards (7,495) and holding almost all Temple’s passing records. Burris admits that while he had a great experience at Temple, it would have been better had the team won more games or gone to a bowl game. “If I could go down there now with the knowledge I have, Temple would have some winning seasons,” Burris said. Burris looks back at the down times as character-building experiences, as his former coach can attest to. Following his collegiate career, Burris went undrafted by the National Football League and signed a contract with the Calgary Stampeders. He spent three seasons as a backup learning the game from noteworthy CFL quarterbacks like Dave Dickenson and current NFL quarterback Jeff Garcia, who both played for Calgary. 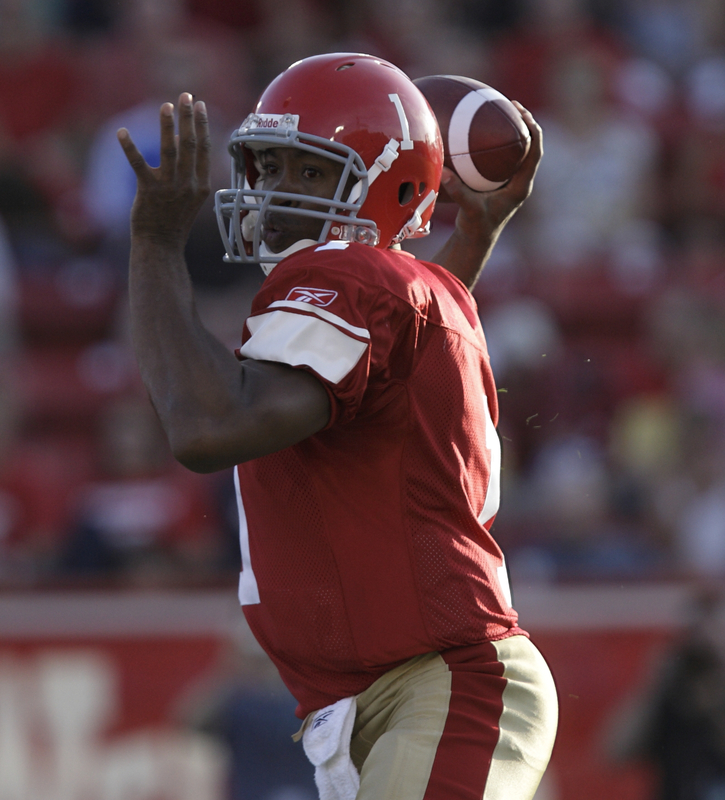 Burris then spent one season as the starting quarterback with the Saskatchewan Roughriders, finishing with 4,647 passing yards and 30 touchdowns. Those numbers earned him a look from the Green Bay Packers. Burris spent his one season with Green Bay as the third-string quarterback. He also played on the practice squad. The following season, he appeared in two games at the end of the regular season with the Chicago Bears, who then sent Burris to the Berlin Thunder in the now-defunct NFL Europe. NFL Europe was geared toward developing younger players, but Burris did not find the league very helpful for his development as a quarterback. When the NFL Europe season ended, he went back to the CFL, where he played one season with Saskatchewan before returning to Calgary, the team with which he started his professional career and has remained as starting quarterback. Burris found it easy to adjust to some of the nuances of Canadian football. In the CFL, there are only three downs instead of four, and there is a 150-yard field and a 20-yard end zone where the goal posts sit in the field of play. He has also become attached to the city of Calgary, where both of his children were born. Many current and former Stampeders players stay in Calgary. The free health care is also a plus for Burris. He did have to adjust to living in a place where football is second to hockey, but winning the Grey Cup has made the sport more popular. Burris may be considered a journeyman, but he has looked at every step of his journey as an opportunity to improve both as a player and a person. The Grey Cup and MVP award made every up and down in the road worthwhile. The football team could be invited to one of four bowl games since the Owls’ bowl win in 1979. With his senior season underway, the Owls’ team captain isn’t worried about all the newfound attention that comes with his team’s higher expectations. Now after seeing several Stamps game, I have been led to believe the team needs several adjustments. For example, most of the time when Burris throws the ball he looks like a balleriena. 2nd would be that, I think there are way 2 many black guys on the team. They look almost like they are doing a tribal dance and let the other team run round them while they celebrate with a stupid dance. Might as well dress Henry up in a tu-tu, and have the team dance around him.